It probably goes without saying, but I’ll type it out anyway: 2012 was an incredible year for education technology startups. Launches. Updates. Funding. Acquisitions. Adoption. Headlines. Disruptions. Drama. Politics. Buzz. Hype. Revolutions. And stuff. With all that’s happened this year, making a list of the “top” new education technology startups was more challenging than ever before – least of which because there were a lot more companies to choose from. Making it tougher still: I’ve met a lot of great entrepreneurs and educators working on a lot of great projects this year. Picking the “top” was hard. I’ve stewed on this list a long long time, and I feel like I’ve left a lot of great folks off it. I could easily double its length. I could just as easily not publish a “Top Startups” list this year. … Meanwhile, I’ve complicated things by expanding my categorization of “startup” a tad to include some initiatives from outside the high-risk, high-growth, for-profit business world. There were so many interesting education technology projects from within academia, from non-profits, and from learners themselves, it seemed a shame not to recognize them here just because of their tax status. I’m also fudging a bit on the number here. The headline reads “10,” but there are 11 on this list. Whatever. It’s my blog. My rules. My rubric — as much as there’s a rubric here. This isn’t some scientifically constructed list of the startups with the most registered users or most revenue or biggest Series A round or most popular iPad app or most Techcrunch headlines. I chose each of these for lots of different reasons (reasons I explain as I highlight them in turn): great technology, great product, great vision, great founders. Full disclosure: I got to hang out with Udacity founder Sebastian Thrun a bit last week. Thrun is at the center of this year’s MOOC maelstrom, with the popular narrative about them centering on his Artificial Intelligence class at Stanford, offered online last fall to wild success and his subsequent decision this year to leave the university to found an online learning startup. I found his excitement and energy for doing something massive, something transformative in education pretty infectious. Bonus: I got to ride in one of Thrun’s other creations: one of Google’s self-driving cars. The connections here between artificial intelligence, automation, and education technology seem to be really under-analyzed by many industry observers, and I think it’s particularly noteworthy that the three big MOOC initiatives of 2012 — Udacity, Coursera, and edX — all have roots in university AI labs. But unlike Coursera and edX, which are partnering with universities to license classes, Udacity is creating its own classes, situating its computer science curriculum outside academia and more closely aligned with the tech industry. I do have to wonder how much of the excitement I hear for MOOCs in Silicon Valley is really a reflection of its own need to better train programmers. There’s the perception there that universities fail to develop classes quickly enough to respond to the new languages or developments. Add to that that many programmers are self-taught or learned outside a formal setting, and computer science feels already like a very undisciplined academic discipline. More disclosure: I signed up for two Udacity classes this year. I didn’t finish either. With all the MOOC-hoopla this year, I could probably fill a Top 10 list with MOOC startups. I’m not gonna. But I do have to mention 6.003z, which as I’ve argued elsewhere, was one of the most important MOOC innovations this year. 6.003z was the creation of Amol Bhave, a 17-year-old high school student from Jabalpur, India who was disappointed to learn that MITx had no plans to offer the follow-up class to 6.002x. Typically, the next class students take at MIT is 6.003, Signals and Systems. So Bhave took matters into his own hands, creating his own open online course with help from two other members of the 6.002 learning community – a class based on a blend of MIT OpenCourseWare and student-created materials. At the heart of 6.003z are the video-taped lectures from Professor Alan Oppenheim (who arguably boasts one of the best mustaches in Eighties educational video – yes, we had educational video before MOOCs. Shocking I know.). In addition to the videos and the other MIT OCW materials, Bhave and others have created tutorials specifically for this class. I fear too that too often we forget that the O in MOOC should mean more than just “open enrollment.” 6.003z was possible because of the openly licensed materials that MIT has made available – materials that students don’t just read or consume but that they are free to remix as well. And 6.003z points to a growing ecosystem for open learning, one that learners and not just institutions should be free to organize. As I noted in the Hack Education email newsletter I sent last week, I do wonder if I should have included crowdfunding as an important ed-tech trend this year. DonorsChoose continued to fund classroom projects. I saw a steady increase in the number of education-related campaigns on Kickstarter and IndieGogo. And there were several interesting crowdfunding startups, two of which make this list. The first is Microryza, a crowdfunding platform for scientific research. I met founder Denny Luan in late 2011 at a Startup Weekend EDU event in Seattle where he pitched the idea and assembled a team that worked on this project. Microryza launched its beta in April, and I covered the story for Inside Higher Ed. Unlike other crowdfunding sites, Microryza isn’t offering rewards and incentives for those who fund projects. That’s because “what matters is the process, not the results,” says Luan. After all, research projects don’t always go as expected. You don’t always get the results you wanted. “You can’t really offer things like ‘I will name a newly discovered butterfly species after you’” to get people to donate, says Luan. The return for those who donate, however, will be insights into the scientific process as recipients update their project profiles regularly. The Microryza site is meant to encourage communication on the part of researchers with their donors, and the donors in turn will be able to offer feedback along the way. This last piece is particularly intriguing to me as this can open scientific research not just to crowdfunding but crowd (peer) learning. This might be the most important thing Microryza do. Unglue.it was one of the startups I was most eager to see launch this year, having followed its founder Eric Hellman’s blog for quite some time. Hellman kept blogging about “ungluing books," and I was intrigued. After the startup's launch, supporters were very quickly successful in liberating Ruth Finnegan’s 1970 Oral Literature in Africa. But only a few months later, Amazon informed Unglue.it that it would no longer process payments for certain crowdfunding sites, forcing the startup to suspend all its campaigns (Kickstarter, which also uses Amazon Payments, was not affected. Huh. Go figure. But the startup doing DRM-free OER e-books was. Weird.). But Unglue.it is back up and running, with more campaigns, ready to unglue more books. More with the crowdfunding, I realize, but this was one of my favorite Kickstarter projects of the year: Makey Makey: “an invention kit for everyone.” I pitched in my few bucks for its crowdfunding campaign which raised 2272% of its initial request ($568,000+ raised with a $25K initial goal). Hackable hardware has such huge potential in education — I wrote a bit about this in my Top Ed-Tech Trends piece that looks at the Maker Movement. Indeed, what convinced me of Makey Makey’s super-awesomeness was the Bay Area Maker Faire. I took my son to Maker Faire this spring — his first trip to one. He walked around wide-eyed, amazed. Makey Makey’s booth was the first where he simply had to touch things. He played the banana keyboard. He and I held hands to complete a circuit. Our bodies were the computer interface. With Makey Makey, anything can be. “Any sufficiently advanced technology is indistinguishable from magic,” said Arthur C. Clarke. But it’s not the level of technical advancement that makes the Makey Makey feel magical: rather it’s the magic of our own creativity and making. 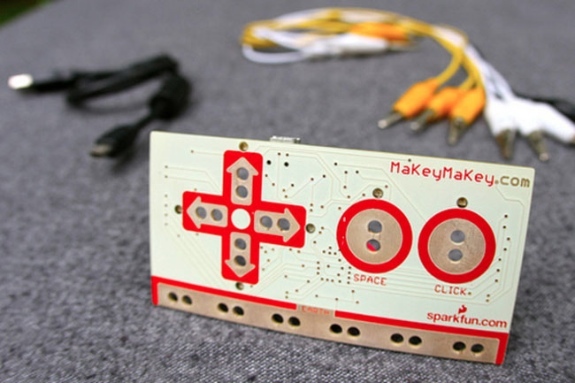 Makey Makey comes out of the MIT Media Lab, with its long tradition of creative computing. Bonus photo: AI pioneer Marvin Minsky, Makey Makey’s Eric Rosenbaum and electronic cupcakes at Gary Stager’s 2011 Constructing Modern Knowledge event. DIY.org wins for the best edu domain name of the year. It can also boast the most beautifully designed site. Heck, even its promo video is worth watching. This strong sense of design is key for a startup that wants to build a social learning network for young makers. But I don’t think the “Boy Scout” comparison is right. DIY isn’t just about boys earning badges. It’s about skills that all kids can learn and can showcase for their friends and family. In addition to beautifully designed, the site has been thoughtfully designed for kids’ safety and privacy but without what Wired describes as “Nanny State rules” in the process. Currently DIY is free — both the mobile app and the website itself — but the startup says it’s looking into offering premium services (per its FAQ). Its founders include Vimeo co-founder Zach Klein. The Domain of One’s Own project provides students with a personal domain name and web hosting, along with the support and training so they can set up a Wordpress blog, manage their databases, and so on. As such, the project helps students create their own digital portfolios, teaches them about the importance of managing their digital identities, and empowers them by putting the tools and the data under their control — not the control of the institutions, the LMS, or other software. The initiative comes from UMW’s Division of Teaching and Learning Technology (DTLT) and from its small but mighty team of troublemakers: Jim Groom, Martha Burtis, Tim Owens, Andy Rush, Lisa Ames. The project was piloted this summer and will be expanded this coming school year. It feels like cheating to lump two startups together here, but the services offered by Learnsprout and Clever are pretty similar: both build APIs so that schools can integrate their SISes with other technologies. This is an effort important enough that I’ve featured Learnsprout and Clever in two of my Top Ed-Tech Trends posts this year — on data and on platforms — because I think the API integration is key here to both. Without APIs, education data remains in silos — unused, underused, out-of-date, “dirty,” and as often happens with rosters and the like, then retyped manually into other applications. What distinguishes Learnsprout and Clever (other some of the technical stuff under the hood...)? Well, the former is a graduate of the ImagineK12 startup incubator; the latter a graduate of Y Combinator. Learnsprout was founded by Franklyn Chien, Anthony Wu, and Joe Woo, formerly engineers at Facebook, Google, and Microsoft respectively; Clever’s co-founders are Tyler Bosmeny, Rafael Garcia, and Dan Carroll, and the startup drawing heavily on Dan’s experiences as a technology district at a charter school network in Colorado. The Learnsprout team were part of the Code for America accelerator program this year and raised money from Andreessen Horowitz; Clever raised money from Y-Combinator, SV Angel, Google Ventures, Bessemer Venture Partners, Mitch Kapor, Ashton Kutcher, 2Tor (now 2U) founder John Katzman, Chegg founder Aayush Phumbhra, and Matt MacInnis, CEO of Inkling. I think you can get a sense from the list of investors here that the tech sector is betting on APIs (and on Clever and Learnsprout) being a big, big deal — for schools and for education technology companies. There are too often these chasms between education theory, research, learning design, product development, and market that seem to stop us from getting smart stuff built. Not so with Go Go Games which I think represents the best of the blend. Go Go Games was among my favorites when I first saw Stanford grad students and startup founders Joy Wong Daniels, Alexis Hiniker, and Heidi Williamson demo it at the LDT Expo back in August. I wrote then: “Wow. This is a project to keep an eye on, and when Go Go Games comes to the iTunes Store (soon, say the team), I’d heartily recommend this app to all families, not just those with autistic children.” The app came out in October (iTunes), and I dutifully wrote a hearty recommendation. The app received rave reviews during its development from parents and teachers and has earned a 5-star rating from Common Sense Media. Go Go Games is designed to support elementary and preschool age children with autism, as I noted back in August: “Incredibly thoughtful game design.” The app offers a series of games — Build-A-Train, Wheels & Roads, and Out of this World — that all utilize Pivotal Response Theory to help children build up the perception skills necessary to play a matching game. That perceptual capability is something essential to learning but incredibly challenging to children with Autism, and helping develop that unlocks many other learning possibilities. “We designed the game to feel more like play but work like therapy,” says co-founder Alexis Hiniker — that is, reinforcing and enhancing the behavioral therapy that many Autistic children receive, doing so through the way many like to spend their free time: playing video games. In June, my friend Shelly Blake-Plock wrote a “farewell” post on his long-running blog TeachPaperless, one that marked the closure of the blog and the end of Blake-Plock’s formal teaching career. These are usually the sorts of moves that depress the hell out of me — someone who I find intellectually inspiring (and I imagine hundreds of students have as well) leaving the classroom. Ugh. Except in this case, my reaction was “hooray!” because the next step for Blake-Plock was to join the non-profit Digital Harbor Foundation, along with fellow teacher Andrew Coy, where the two have launched a number of incredibly important and innovative programs to help connect teachers, students, and technologists. A little bit teacher professional development. A little bit tech training. A lot of student empowerment (with the possibility too of a paycheck for participating students). Based in Baltimore, the foundation’s programs also help support the community and foster local tech entrepreneurship. Students from the Digital Harbor Foundation are also working to improve the content and infrastructure of the Edtech Handbook, a guide to launching an education startup — and more voice, more participation for students is something I hope we see more of in the ed-tech of the future.